The Survivor is an Instant #1 New York Times Bestseller! On Wednesday, October 14, 2015 The Survivor, the latest Mitch Rapp novel written by Kyle Mills, became the number one fiction novel on the New York Times bestsellers list. 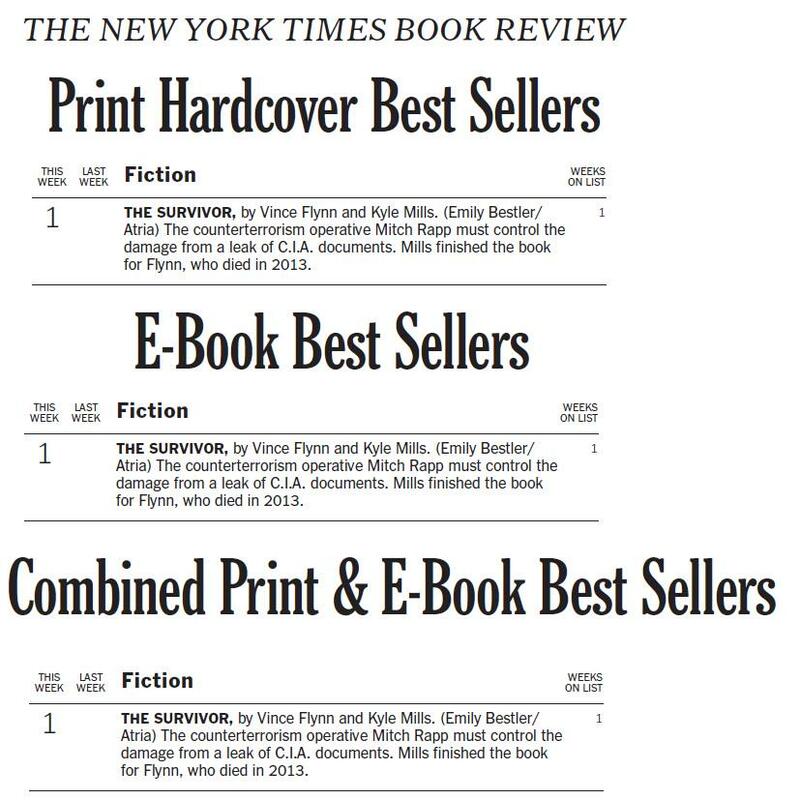 In an impressive sweep, The Survivor is the top bestselling novel in all three categories: Hardcover, eBook, and Print/eBook combined. The Survivor hit bookstores on Tuesday, October 6, 2015 and has received high praise by review sites and fans. While a lot of people deserve credit for an incredible launch there’s really only one person to start with when offering congratulations, and that is beloved author Vince Flynn and his family. Vince Flynn created Mitch Rapp and introduced him to readers in 1999 with the book Transfer of Power. Since then, Flynn, a native of Minnesota, became an annual staple on the New York Times bestsellers list up until his death in June of 2013 from prostate cancer. At the time of his passing Flynn had completed only three pages of The Survivor, his fourteenth novel featuring CIA super operative, Mitch Rapp. Nearly one year after the announcement that The Survivor was postponed due to Flynn’s passing, Emily Bestler Books (An imprint of Atria Books at Simon & Schuster) announced that Kyle Mills would be continuing the series starting with The Survivor, which he was hired to complete. Mills, a bestselling author in his own right, is signed for an additional two novels after The Survivor, ensuring there will be plenty more Mitch Rapp in the future. Speaking for fans everywhere, I cannot begin to express how lucky we are to have him on board. Kyle is the real deal, and a brilliant author. While Mills is certainly no stranger to the New York Times bestselling list (he’s been on it twelve times prior to this book) The Survivor marks the first time in his career that he’s been a number one bestseller. So for that, congrats Kyle! A lot of people contributed to making sure this series continued on for Vince’s readers. Fans also owe a very special thank you to all the people at Emily Bestler Books, Atria Books and, of course, publishing powerhouse, Simon & Schuster. To all the fans, many of which are so loyal to Vince and wanted to see this book hit number one to honor him, we did it! If you haven’t already, order your copy of The Survivor today! “I don’t try to kill people, Irene. I either do it or I don’t.” – Mitch Rapp (Kyle Mills) in The Survivor. So pleased to see the success of this book!!! Me too, brother. Me too! Ryan: You nailed it. Awesome!